The headline article this update is the games of Donald Duck, which covers over twenty title starring Disney's easily irritable water fowl. It's an expansive article, seven pages in length, with some absolutely fantastic material. It includes a look at Sierra's classic computer title, as well as an interview with Al Lowe, its designer from way back when. It also desperately makes me want to replay Quackshot - I don't think I've touched it since I rented it over at a friend's house in sixth grade. It also accentuates how popular Donald Duck still is in Europe, something I was never aware of. 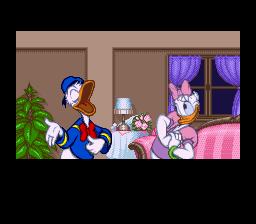 It also includes an interview with Darlene Lacey, a producer at Disney who was at the head of a handful of games, including the NES version of Duck Tales. On the extremely obscure side, we have looks at Psycho Dream, a Super Famicom sidescroller from Telnet, and Neural Gear, a rather cool 3D Space Harrier-style shooter for the Sharp X68000. Continuing with more shooter coverage is Strikers 1945, arguably Psikyo's flagship series. (If you don't count Gunbird or Sengoku Ace...it could go either way.) We also updated the Trouble Witches article to detail some of the additions to the recent XBLA port...which as it turns out, isn't a whole lot, other than some new graphics and several additional characters. And if you haven't already, please check out the Brief History of Western Action RPGs from a few days back, which chronicles dozens of computer games ranging from 1978 to 2000. Just please don't explode the comments regarding an off-the-cuff remark regarding the quality of Mass Effect 2, as what happened in the Kotaku article. I know Bioware are the guys to hate nowadays, but c'mon, really. I was quite surprised to see a Neural Gear review here. I had only heard parts of the soundtrack on a HOOT compilation, so I assumed it was an 80's cyberpunk RPG, in the vein of Illusion City. To think it was actually a Space Harrier clone! FULL DONALD FAUNTLEROY DUCK ARTICLE IS UNLEASHED.